'tenting' the boule or loaf with aluminium foil for the first 10 minutes or so of baking. Just tear off a length of foil, make a loose tent and lay it over the dough once it's in the oven. Expect HUGE rise, but also be prepared to cook an extra few minutes (as much as 10, for me). I do this on a pizza stone, by the way; not in a Dutch oven. I usually don't bother, since the bread is so good anyway, but it does give spectacular results. But having said that, last night's loaf was pretty spectacular without it. No pictures, and mostly all gone! I have usually done the, pour very hot water in the cast iron pot in the bottom of the stove, for a shot of steam to emulate how a pro baker's oven works, touted by countless bread authors' method. A "magic" bowl method was discovered which I have done three times now instead. The idea is that covering the dough with a stainless steel or a aluminum or pyrex bowl, on top of the pre-heated baking stone/oven, will trap the steam coming off the dough and have the same effect. I bought a large SS bowl to do it this way and while it is much safer, and less intimidating then the throw water in a 450-500 degree oven way, I do not think IMHO it works as well. On the other, very expensive side is this 'system' Almost all who have used it, wrote about it, which I have read their reviews/comments agree it works extremely well. I realize that taking the four elements of the kit, one by one, you can buy them NEW at about 1/2 the price of what the 'kit' sells for. Large stone (I'll be generous on retail prices with delivery for all) $50., steam making gun $40, stainless steel cover if one could find a comp $40, a plastic measuring cup, well let's say freebee . One of the problems for me is drilling a hole in the right place on the top. The inventor, when grilled strongly, insists the steam maker is of superior materials than the one that looks exactly like it selling all over the web for $40. Then one has to get a new SS top with handle that fits perfectly on the stone, and then having to drill the perfect size to fit the nozzle of the gun. I've seen the Rube Goldberg versions of the kit, I've seen copper pipes fed into stoves w steam a gun feeding the steam thru and a variety of other ways to achieve a easier, safer, no chance to crack oven door glass and hot water burn back from 'throwing' water into a hot oven into a red hot vessel to create steam, way. I'm not creative, using building tools (drilling into SS) is not a thing I know, I am limited to finding a top that would work by my location and have not found a new top to buy by itself. I will be pushing the easy button and buying the kit, its just a question of when. I do need a larger stone than the 13' diameter one I have now and a gun, that puts me 1/2 way there anyway. PS: Dough in bucket, same hight 24 hours later. Heartsurgeon - Oh, thank you! 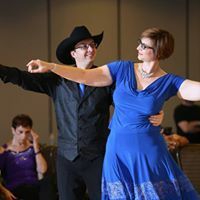 Pictured below are photos from an early effort. My second loaf, in fact, which explains the poor shaping and slashes. LOL! This one I let rise on cornmeal and then slid/pushed it off the board onto my stone, poured hot water into a pan on the lower rack and closed the oven door. I had a little trouble moving the loaf onto the stone so have used parchment paper and the cornmeal for all subsequent loaves, on the stone or in the dutch oven. 'system' Almost all who have used it, wrote about it, which I have read their reviews/comments agree it works extremely well. Just pushed the easy button and ordered the kit. Dough in bucket: Chapter III.....I noticed a dark brownish color on the bottom of the bucket. Hmmm, cannot be something not good as there was really no culture happening before mixing the new batch. I did not clean out the old stuff, following Zoe's advice of leaving any old bits for a sour dough thing to happen. I think it is the liquid Barley Malt settling, OK, in for a penny in for a pound with not following formula directions, I turned the bucket upside down, to allow the stuff on the bottom to mix with the rest. I then noticed solid white stuff which I can only think is not mixed well dough. So, LOL, this should be very interesting when I finally attempt to make a loaf from this mixture. Oh, one other thing, the mixture is now the size of the ingredients, rather than having any rise like it did. 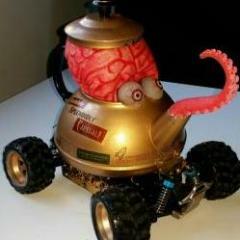 I've seen the Rube Goldberg versions of the kit, I've seen copper pipes fed into stoves w steam a gun feeding the steam thru and a variety of other ways to achieve a easier, safer, no chance to crack oven door glass and hot water burn back from 'throwing' water into a hot oven into a red hot vessel to create steam, way. I'm not creative, using building tools (drilling into SS) is not a thing I know, I am limited to finding a used top that would work by my location and have not found a new top to buy by itself. I will be pushing the easy button and buying the kit, its just a question of when. I do need a larger stone than the 13' diameter one I have now. I really like using this kit. The stone fits perfect on my oven rack. After following instructions on how to make the stone ready for use by increasing the temp by 100 degrees till 600 or the highest possible, in my case 500, and letting it stay at that temp for 1.5 hours the stone performs perfectly. The lid fits perfectly and will accommodate anything I can think of to cook under it. The steamer unit itself, is made of high quality parts as it feels to me. Mark Schimpf, the owner could not have been more accommodating and helpful. He always answered my inquiry's via email thoroughly and usually within 20 minutes! I feel that I got a major boost to my bread baking technique with having steam already made and I am now in complete control of how much to use for how long. Also the safety factor to body and oven is without measure. I highly recommend getting it. Purely academically, can anyone tell me why you would add the salt into the water with the yeast and not with the dry ingredients? I thought salt retarded yeast development. It would seem you would want the yeast to get started multiplying before you added in the salt to the equation. I've seen this in recipes before and always wondered. My guess is the reason behind it is just to ensure even distribution of the salt. For this type of bread we spend most of our time deliberately retarding the growth of the yeast (using cool water, refrigerating, etc.) to give the flavor time to develop before the yeast have finished doing their thing. So I don't think that's a concern here. I seem to remember this being answered somewhere (perhaps on Zoe and Jeff's site, but I just had a quick look and can't find it). If my recollection is correct, the answer was that, yes, technically the salt will slow down the yeast, but in practice it's a pretty simple recipe and you're putting the dough together so quickly it doesn't matter. Zoe, if you're watching, feel free to correct this! Chris - you've got a new photo!! Everything is mixed together within a few minutes. I can't imagine how adding the salt to the water first, or the flour first, is going to make any measurable difference in the performance of the yeast. I put all the minor dry components (everything but the the flour) into a container first, add water and whisk until all the solids have dissolved. Then i add the flour and mix it in. 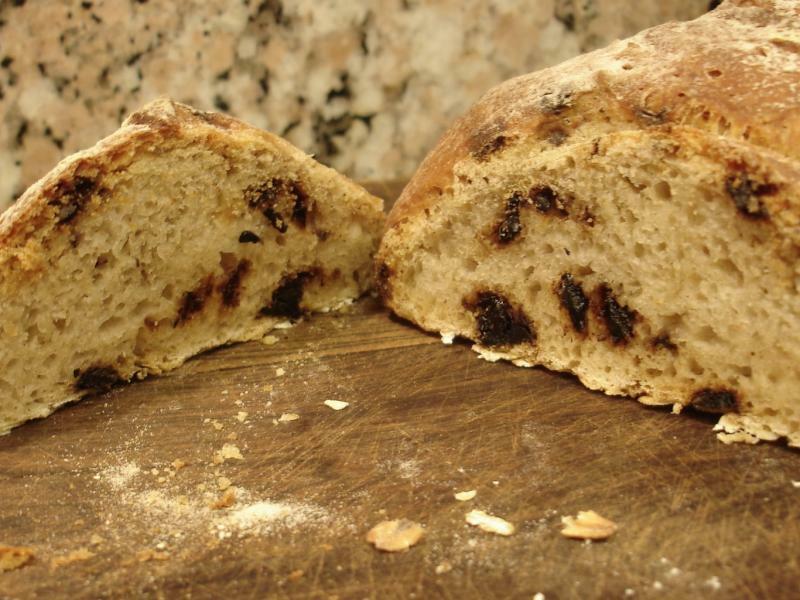 If you don't get the minor dry components (particularly the malt) dissolved first, and evenly distributed in the final dough mix, you end up with little pockets of clumped up malt in your bread. (rosemary/garlic infused olive oil made by adding strippings off 10 sprigs of rosemary, and 6 peeled cloves of garlic to 1/2 cup of olive oil and pulsing into a mash using an immersion (stick) blender. the result was strained through sieve, yielding the olive oil and minced rosemary, which was also added to the dough. the remaining olive oil and rosemary was recombined, and later drizzled over the foccacia just prior to baking. 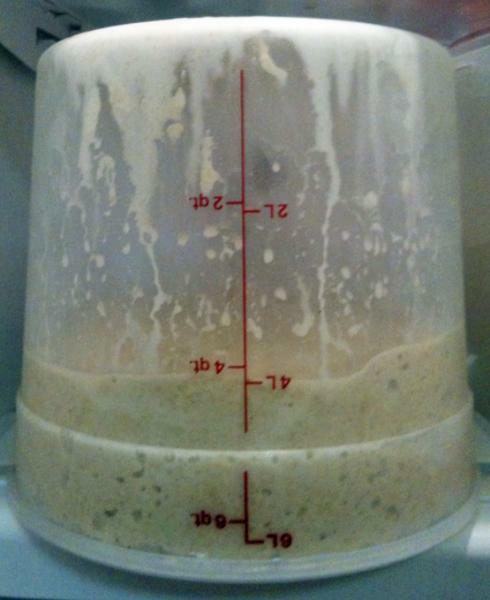 The dough was allowed to rise for about 3-4 hours. the dough was pressed out with my fingers until it was about 1/2 inch in thickness, and allowed to rest for about 40 minutes. dimples in the foccacia where made with my fingers, and rosemary/garlic/olive oil was drizzled over the foccacia. a very light sprinkle of Kosher salt over the focaccia, then into a pre-heated oven at 400 for about 30 minutes. The obligatory 1 cup of water into the broiler pan added when the bread went in the oven. way easier than making boules, as i only make one big loaf, and since it's all done on the silpat, minimal cleanup, no transfer issues. no need to wait for the flavor to mature, as the rosemary provides plenty of flavor. Thanks heartsurgeon! 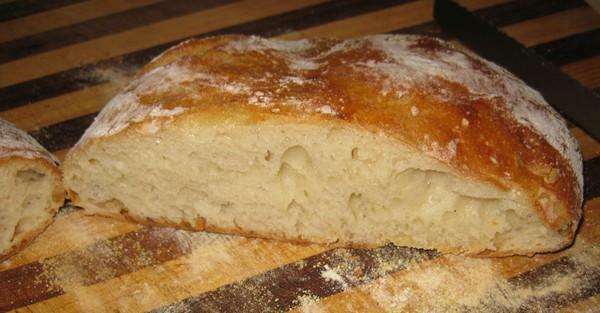 Even without the infused oil, malt powder or semolina, this makes fantastic focaccia. It also makes amazing pizza crusts. I have never been happy with my pizza crusts until using this recipe. Thank you! with the foccacia bread, the rosemary/garlic/salt combo is so flavorful, that the malt and semolina are probably not really contributing in a perceptable manner. you really have to try the rosemary/garlic infused oil. take your extra virgin olive oil, add lots of fresh rosemary (without stems)and several cloves of garlic and use a stick blender on it. strain the oil (it will have a gorgeous bright green color and an intense rosemary/garlic aroma) and use 50 gm/ml in the dough mix. Add 1 heaping tablespoon of the strained solids (rosemary and garlic) as well. Mix up your dough. reserve the remaining oil. just before baking, dimple the dough, and liberally brush the surface with the infused oil. lightly sprinkle the oiled dough with kosher salt. 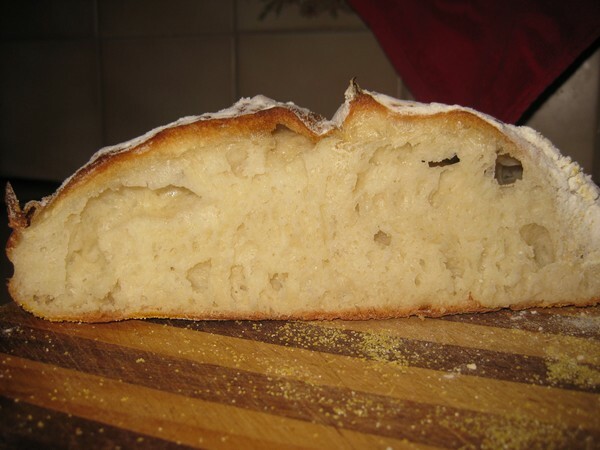 I no longer spinkle rosemary on the surface of the foccacia, as it tends to burn when baking..
this bread is simply amazing...you don't need any "dipping" oil with herbs or seasonings, as it is already incorporated into the dough. try it. you'll need looser fitting jeans once you do! OK, Heartsurgeon's focaccia is definitely on my list! One question, HS - what yeast did you use? You specify 12g, which is about what I use of fresh yeast in the basic recipe, but was yours fresh or dried? i use Fleischman's Instant Dry Yeast. i buy it at Sam's Club, about $5.00 for 2 pounds of yeast! it comes 1 pound foil packets. I keep it all refrigerated, and store the yeast in a Foodsaver jar under vacumn (came with the Foodsaver Sealer Kit). two pounds of yeast lasts me about a year! very reproducible results, NO flavor difference compared to many other yeasts including fresh. i went through a phase of trying all the different types of yeast i could find, to see if i could make my bread taste better (including the fresh yeast). frankly, the only difference i could identify was the price. the fresh yeast is crazy expensive compared to the Sam's Club/Fleischman's dry yeast. my flavor breakthrough (breadier tasting bread) was the addition of malt. the malt idea i got from reading the ingredients list of La Brea Bread, which i happen to like a great deal. actually, the whole reason i got into bread making was the La Brea bread went up in price significantly several years ago, and it irritated me to pay that much for bread, so i decided to make my own! i also trued numerous different flours, and ended up really liking King Arthur. there is a local grain miller about 30 miles away that will mill me winter wheat (high protein) 50 pound bags very inexpensively. I haven't done it to date, but you never know. if anyone out there is making large amounts of this bread, you may want to investigate local millers that will do this for you. google maps searching for grain millers will help you find them near you. The salt technically will retard or slow down the yeast if left in a wet solution, but the recipe is going together so quickly it really won't make an appreciable difference in the dough. In all of the buckets of dough (and there have been 100s) I have made, I have never noticed a difference in the performance between batches mixed with the salt and yeast together or separated. I have added the ingredients to the bucket in every possible order and the outcome of the bread is always the same. The only exception is when I am adding VWG to a batch of whole grain dough. Like Heartsurgeon I use a bulk yeast that I buy from my local costco, but in my case it is RED STAR. It is a 2 pound vacuum packed bag for about $3.50. I love the results and it is a huge savings. Heartsurgeon's basic formula with chopped sundried tomatos and brewer's yeast added. Very rustic, different. you need to mail me some of the bread for a taste test! Like to -- but it does not travel well - and, we ate it all. This has been a great thread, and I have read each page with interest. I've just started experimenting with the recipe suggested by Heartsurgeoon. I'm now onto my 3rd batch and thought I would share my experiences. 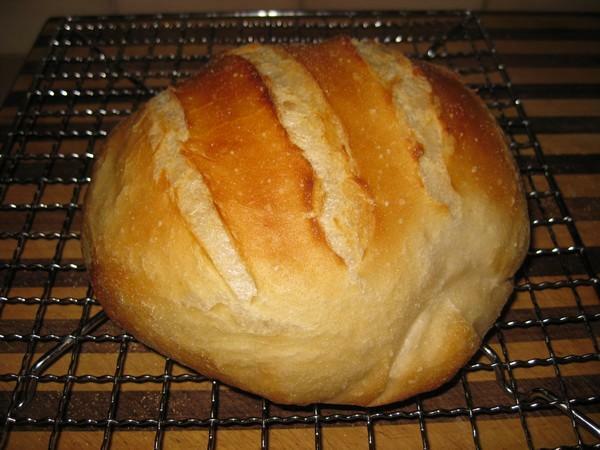 Here is a picture of my first loaf. It was based on 100% all purpose flour, and I was so keen to try it out I only had it in fridge for 24 hours (sounds like a common mistake). I put way too much dough in the pot for this one. 75% hydration as suggested by Heartsurgeon, but this was too dry for my flour (I did not know this at the time). I handled the dough quite a bit while shaping it. 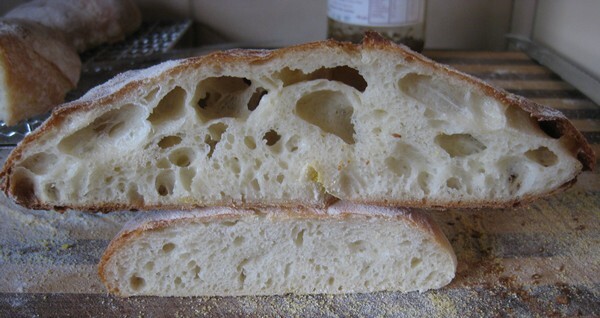 The crumb was dense and tight. My second batch of dough was left in the fridge for 3 days. It was made with a mixture of special white flour (I'm not really sure what is "special" about it) and all purpose flour. Hydration was increased to 78%. It was smaller, had more oven spring, better flavour and crumb was OK. I came to the conclusion that due to the flours I was using, the hydration could increase while still keeping the dough workable. As noted by Heartsurgeon, you need to be prepared to experiment. So I did. Flour was again 75% special white, 25% all purpose. Hydration was increased to 85%. It spent 4 days in the fridge. As you can see, it produced an excellent crumb, but it was very hard to work with. I think a hydration of 82% would be more appropriate. That being said, it was the best bread I have ever made. The air pockets were exactly what I wanted, and I flavor was fantastic. Crust was crunchy too. I took some of the dough and tried the technique suggested by lesleic on page 20. It didn't work. I'm not sure what I did wrong. 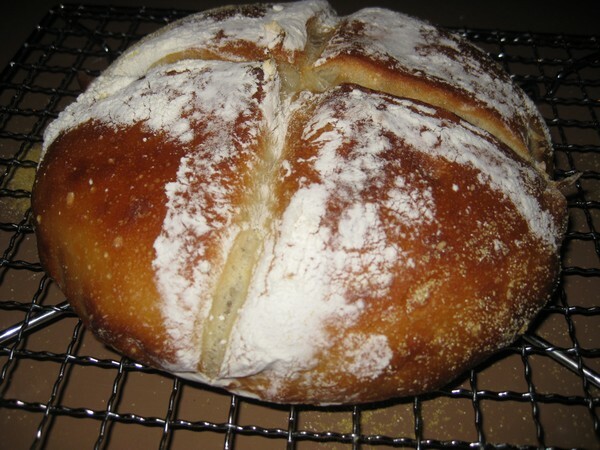 You can see in the last photo, the bread on top was the boule that had minimal handling before baking. The loaf on the bottom was a ciabatta style loaf which was folded as per lesleic instructions. I've just made my fourth batch with 80% hydration and I'll let you know how it goes. 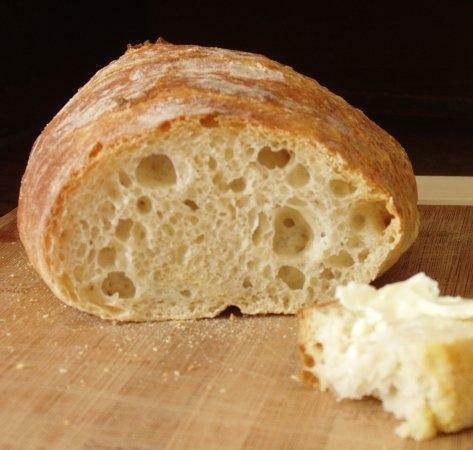 you have 2 options to improve crumb. increasing hydration ( which you've done). the second is rise time. how long are you letting your dough rise after you've shaped the boule? i gradually increased the rise time to 2 hours, and found that it improved the crumb significantly. 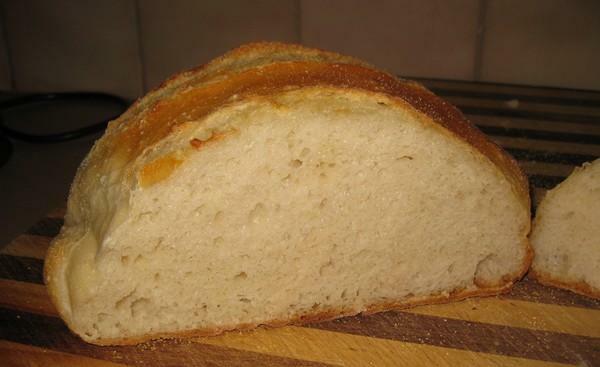 i tried making bread years ago, and was not very successful (super dense and bland). gave up. 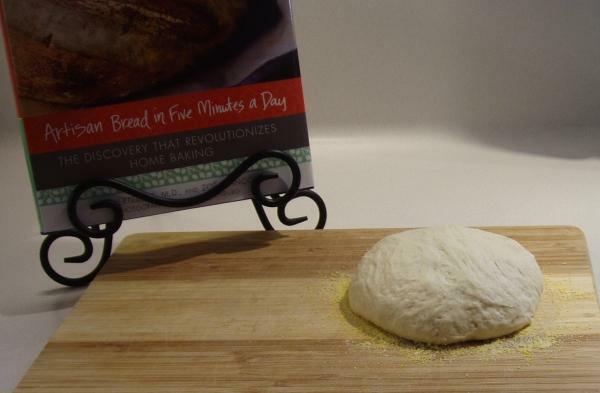 this technique (props to Zoe), makes bread baking easy, reproducible, and fun. It does require tweaking however, as every little thing has some effect on the final outcome. 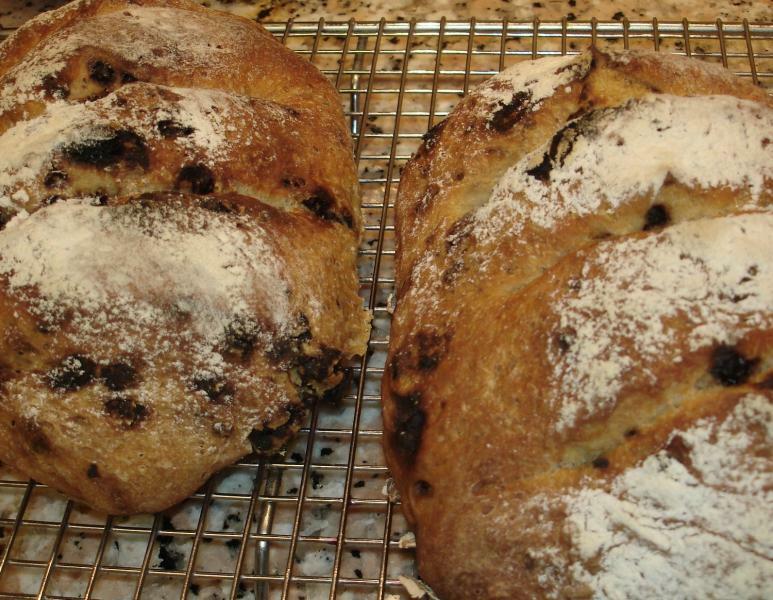 However, by harnessing your OCD, fabulous bread can be result. Or, as Heartsurgeon mentions, maybe it wanted longer to rise afterwards. I generally only let mine rise for half an hour or so using the basic recipe, but with variations in ingredients, ambient temperature, whatever, you may need longer). Persevere, sir, persevere. 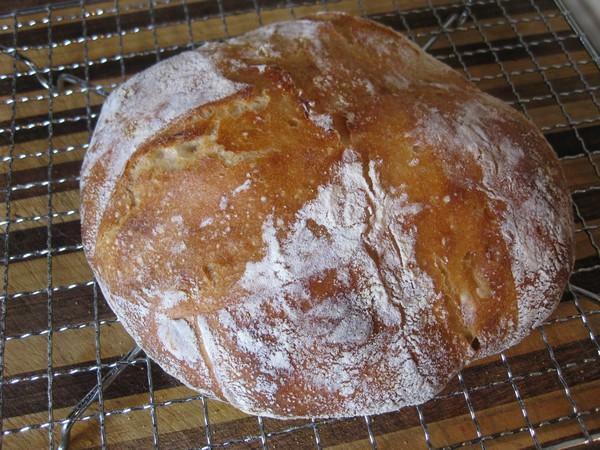 This is a fabulous way to produce magnificent bread with, really, very little effort. I think I have this pretty close to where I want it now. 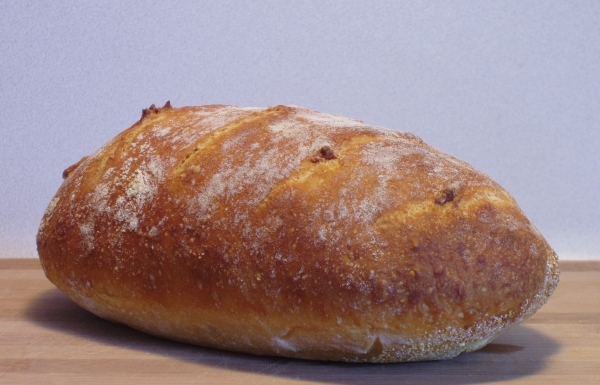 Here is a photo of a loaf from batch #4. Here is a close up of the crumb. I have not dusted off the flour yet. Mix, Rest out of fridge 1 hour, retarded rise in fridge 3 days, remove, shape, rise 2 to 3 hours depending on how warm the ambient air temp is. Cook in pre-heated pot with lid for 30mins @ 250 deg cel, remove lid cook for 15 minutes at 215 deg cel. The only aspect I am not entirely happy with is how I am slashing the dough before baking, and the crust. i agree you slashing technique is not optimal. if this advice sounds pedantic, i apologize. it reflects my own experience (mostly errors). your bread should "open up" more with proper slashes. this will make your crumb (which looks pretty darn good already) even better. I prefer deep slashes. Slashing high hydration dough is tricky however. The dough sticks to your knife, and the wet dough tends to seal back up after its slashed. I use a teflon coated knife (Kuhn Rikon Paring Knife Nonstick, abpout $10.00), that i hide from the family, so it only gets used to slash dough. Slash the bread JUST before you pop it in the oven, not a moment sooner!!!!! I place a line of flour on the dough, just before slashing, where i plan to make the cut. As i make the cut (usually 2-3 cuts per slash), i knock lots of the flour INTO the slash, after the first cut. This is critical, as it keeps the slash open. The 2nd and 3rd cuts are then being made through a valley filled with flour, to end up with a flour coated slash of the desired depth. Then pop the bread into the oven, then add the water to the pan. If you slash to soon, the slash will seal up, if you don't push flour into the slash, the slash will seal up. it appears to me, that your slashes may have sealed back up before the bread had a chance to really rise up. if you do it right, the bread will have tremendous loft, and the bread will open up like a flower. 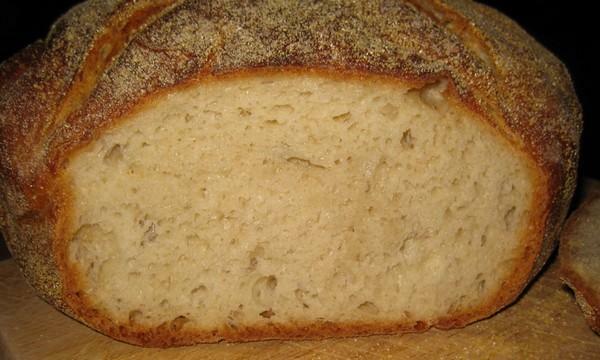 also, try some malt power, it makes your bread taste more "bready"
I don't have any problem with slashes since I started using my scalloped bread knife (see post 578 for a closeup of the blade). I do my flouring (not very thick; just a general dusting over the whole surface) before slashing; the edges of the slash spring back from the blade, revealing the 'raw' surface underneath (I've always imagined that the contast between the floured and 'raw' surfaces is what gives the lovely striped appearance of a cooked loaf. Any dissenters?). Again just theorising, but if your dough doesn't spring away from the knife, could it be under- or over-risen? I mean mine really springs - just as I would if somebody ran a sharp knife over me! I'm still not happy with my own slashes but I have read that the slashes are best when made more on the horizontal than on the vertical. I've just bought a new bread knife and plan to use it the next time I make slashes. I'm new to bread making and have had a couple of tries of the plain white bread and the sweat potato spelt bread and am in need some help. The bread looks terrific straight out of the oven and it keeps a nice crunchy crust BUT the texture inside is gummy and needs to be toasted to be edible. Thank goodness I have a teenager that will eat mistakes!! I've tried reducing the water each time I've mixed up a new batch to keep in the fridge but once cooked the texture seems to remain the same. I've also tried cooking the bread longer to the point where the outside crust is almost burnt. I've checked the oven temp and am sure that it is accurate. Do I just keep reducing the water or am I missing something??? 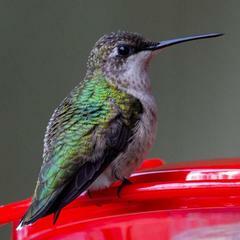 Thanks for any thoughts, I'd like to master the basics and then move on to some grain bread. Quasar- just my 2 cents but I think you are not getting the oven spring. I have had loaves like that when I just plop the dough on the pan and bake. Still good but needs a toast to shine. What method of baking are you using?